Artist's illustration of a large asteroid headed for Earth. NASA has updated its plans to deflect potentially hazardous Earth-bound asteroids — and none of them involve Bruce Willis. The White House Office of Science and Technology Policy released a new report today (June 20) titled the "National Near-Earth Object Preparedness Strategy and Action Plan." 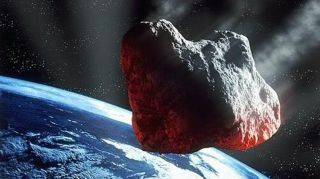 The 18-page document outlines the steps that NASA and the Federal Emergency Management Agency (FEMA) will take over the next 10 years to both prevent dangerous asteroids from striking Earth and prepare the country for the potential consequences of such an event. "This plan is an outline not only to enhance the hunt for hazardous asteroids, but also to better predict their chances of being an impact threat well into the future and the potential effects that it could have on Earth," NASA's planetary defense officer, Lindley Johnson, said during the teleconference. Johnson added that the plan will help NASA "step up our efforts to demonstrate possible asteroid deflection and other mitigation techniques, and to better formalize across the U.S. government the processes and protocols for dissemination of the best information available so that timely decisions can be made." Five major objectives are detailed in the new plan. In the first, NASA is directed to lead a new effort to enhance the nation's capabilities for detecting, tracking and characterizing near-Earth asteroids to "reduce current levels of uncertainty and aid in more accurate modeling and more effective decision-making," the document states. NASA already supports several ground-based observatories that scan the skies for asteroids, like the Catalina Sky Survey in Tucson, Arizona; the Pan-STARRS1 telescope, in Maui; and the NEOWISE space telescope. While the new report doesn't ask NASA scientists to start planning for additional missions, it does request that the agency "identify opportunities in existing and planned telescope programs to improve detection and tracking by enhancing the volume and quality of current data streams." The second goal listed in the document discusses the improvement of "modeling, prediction and information integration" across U.S. agencies to help predict the probability that an asteroid will hit Earth and determine exactly when and where an incoming asteroid could strike. Emergency-management teams like FEMA would use this information to determine the best course of action when preparing for an asteroid strike and dealing with the consequences after an impact occurs. In the third objective, NASA is asked to come up with new ways to deflect an asteroid heading toward Earth. This involves developing new technologies for "rapid-response NEO [near-Earth object] reconnaissance missions," in which a spacecraft could launch toward an Earth-bound asteroid and somehow change the space rock's course so that it no longer posed a threat. NASA had plans to attempt this with the Asteroid Redirect Mission (ARM) in 2021, but the Trump administration scrapped that mission in 2017. The focus of the fourth goal outlined in the document is to increase international cooperation to better prepare the rest of the world for the possibility of an asteroid strike — under the leadership of the United States. "This kind of cooperation is really important," said Aaron Miles, a senior policy adviser with the White House Office of Science and Technology Policy. "It's a global hazard that we all face together, and the best way to approach and address that hazard is cooperatively." To help the rest of the world prepare for an asteroid strike, NASA's Planetary Defense Coordination Office is working with the United Nations Committee on the Peaceful Uses of Outer Space to "look at what should be the international response to the NEO hazard," Johnson said. This committee created the International Asteroid Warning Network — a group of asteroid-tracking astronomers and observatories around the world — to help facilitate the sharing of observations and other useful data about NEOs. In the fifth and last objective in the document, the U.S. government is asked to come up with a plan that would go into effect if a large asteroid were found to be hurtling toward Earth — or if one were to crash into our planet with little to no warning. NASA and FEMA have been collaborating on emergency procedures for asteroid impacts since 2010, and the new report calls for the agencies to "strengthen and routinely exercise NEO impact emergency procedures and action protocols." FEMA's role during an asteroid emergency would involve notifying everyone who might be affected — ideally before the impact occurs — using the same emergency-alert system already in place for notifying the public about weather emergencies and Amber Alerts. As with any other natural disaster in the U.S., FEMA would provide emergency responders and help with the recovery process. Asteroid-hunting astronomers have already found more than 8,000 near-Earth objects measuring at least 460 feet (140 meters) across — large enough to wipe out an entire state if one were to hit the U.S. But asteroids that size make up only one-third of the estimated population of near-Earth asteroids. This graph shows the total number of near-Earth asteroids discovered as of April 8, 2018. "NASA and its partners have identified more than 95 percent of all asteroids that are large enough to cause a global catastrophe, and none of those found poses a threat within the century," Miles said during the teleconference. "Effective emergency-response procedures can save lives, and unlike most natural disasters, asteroid impacts are preventable," he added. "Implementing the National Near-Earth Object Preparedness Strategy and Action Plan will greatly increase our nation's readiness … to effectively respond, should a new, potential asteroid impact be detected," Johnson said.